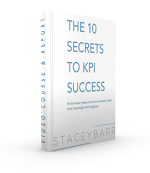 What is the ROI on KPIs? Measure Up reader, Paul O, asks: How do I educate my clients (and win new ones) in SMB of the power and ROI behind great KPIs? 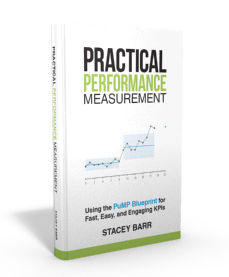 We can easily forget that performance measurement isn’t about filling up the KPI column in the strategic plan. It’s not a bureaucratic hoop to jump through. Performance measurement, when it’s done well, makes a very important difference. When we are deliberate about measuring what matters, and measuring it well, we reach our goals sooner and with less effort. We can routinely get returns on our investments (ROIs) of a hundred times or more. This means that when we invest time and money (and time is money) in making changes to our business, those changes generate returns (usually cost savings or revenue increases) that are a hundred times more than the investment. As the model above suggests, the better we get at measuring performance, the more meaningful targets we can reach. The better we get at reaching meaningful targets, the greater return we get on our improvement initiatives. Getting the results that matter for the least effort is exactly what a high-performance organisation is. And that’s exactly the difference that good performance measurement makes. Having no idea what the ROI is on your initiatives is the worst way to be. It means you’re making investments like playing poker with a blindfold on. It’s all luck, and more bad that good. Your only choice is to take the blindfold off by measuring. When you actually know that your investment in improvement initiatives is costing you more than you’re gaining, you have choices. You can withdraw your investments from dying initiatives, or you can fix the initiatives. Turn the momentum around with a few quick wins driven by good measures. When you don’t have systematic approach to measuring what matters, you can at best expect to have a few modest ROIs here and there. To get better, you’ll need to nurture a culture of measurement and continuous improvement. When you start taking targets more seriously, you start reaching some of them, and getting some respectable ROIs. Taking targets seriously means measuring the right things, finding out your baseline, and setting targets that make sense given your baseline and the resources you’re willing to invest in improvement. This takes capability, because good measurement and target setting are not natural skills. When you have the ability to reach most of the (meaningful, not trivial) targets you’re setting, it shows you have a pretty good handle on the capability of your business processes. You’ve learned enough about how they work and what constrains them, and so you get very respectable ROIs. Here, your job is to integrate the approach of performance measurement so it becomes “just how we do things around here”. All targets? Really? Well, virtually all of them. When you reach just about every target you set (and assuming you’re not setting easy-peasy trivial targets and you’re not setting demoralisingly-vast stretch targets), you know what matters and how to stay focused on it. You’re now looking for leverage, to find the easiest ways to get the biggest gains in the fewest things that matter. Can you think of exceptions to this model? Of course you can. No model is perfect. Models aren’t supposed to be perfect. They’re supposed to be useful. And the use in this KPI ROI model is to make your pursuit of high-performance deliberate. If you knew it would take another five years for your organisation to truly have a high-performance culture, what would you start doing now? Stacey, this is very useful. Of course, the first time measure up newsletter arrive in Congo-time but a good parallel, that, ROI from our measures only come gradually, in Congo-time, not abruptly. I think, for most of our organizations, we are learning that the starting point should be self realization. We need to realize and accept that trivial measures are destructive. Then, select appropriate approach to designing and implementing measures. At application level, I am yet to seen a better and cost effective measurement approach to PuMP methodology. Those are wise words, that the starting point is self-realisation, or self-awareness. Without that, there is no relevance to learn a different way. Think I would try to find the most mature team in the organization in terms of using measures and then identify their biggest pain and help them create performance measures that address the issue they are facing. Niels, perfect suggestion. Start where the energy is and focus it on something meaningful, making it about solving a problem and not about measuring performance for measuring’s sake. Of course we need courage to do something different, or pioneer a better way. So when we can get a few teams doing it and showing it can be done and it works, we’ll be sending out ripples of buy-in for more teams to start too. Stacey – Thanks so much for addressing my question! There’s a lot of good material in that answer that I can put to use with my clients. And it brings up a follow-up question. Do you generally find that measurement ROI follows a bell shaped curve? By that I mean that the maturity model of measurement starts slowly (possibly with culture shock and fear of reprisal for poor performance and/or technical hurdles), so ROI is low. Once the organization realizes the measurements won’t be used for punishment and any technical hurdles are cleared, there’s a period of very high ROI while harvesting the most opportune improvements. Finally, the organization settles into lower ROI on measurement since all the low-hanging fruit has been harvested. Is that what you find, or can measurements reach and maintain a really high ROI level? Thanks! Paul, I don’t think it is a bell-shaped curve. When you start measurement properly, with a methodology that focuses on improving process performance and not on judging people performance, it directly reduces the fear and angst people have. Then as more and more people see that measurement is a tool in the hands and not a rod for their back, they practice more and more process performance improvement. They get better and better and designing great measures and using them to get high leverage improvements in process performance, and so the ROI on using measures gets higher. And then when the organisation’s culture is very much about high performance, the ROI on some measures can be dramatic. So for the first few years, I reckon it’s more like a exponential curve. Stacey, Love you comments and in theory you are dead on. I have seen where people try to come up with these KPI’s, but they are the wrong ones for the floor, or lower levels so they get lost. Or some companies use the standards, versus using capacity or capability. When this happens, most of the controlable opportunities never get identified because nobody wants to admit they are doing a bad job or not being as effective as they could be. As for standards, they are usually a stake in the ground to measure against last years average performance plus a small stretch. It comes down to getting lower level leaders involved and ensure they communicate with their people. It takes setting up the right metrics to create a company culture, give the lower levels tools and training how to control them, keep the workforce involved/communicated with and companies will yield double digit improvements. You need a culture, tools, metrics, and accountability to shape the behaviors of the lower level leaders, so it becomes routine. They do what is expected or communicated from upper leadership, and without a culture/process/training it is hard to say they are at fault for low performance. I have been doing this for over 25 years, it works in all industries. So long as the competition is a game and not an obligation or expectation. Otherwise we get all those dysfunctional behaviours that come when people take it personally.